Mid-19th century. Imposing 4-storey, gabled former corn mill with 3 lower ancillary wings forming T-plan. Whitewashed, random rubble with raised sandstone ashlar door and window margins. Long and short quoins. MILL: 3 bays. Fairly regular fenestration to 4 storeys; some windows blocked up. Ancillary ranges adjoining to N, E and W. Former 1st floor loading door to W elevation with arched hood above. N RANGE: slightly lower 2-bay former kiln with gabledhead stack adjoining mill; timber-boarded doors to both elevations at ground. Cottage adjoining kiln with extensive 20th century alterations. W RANGE: 2 storeys with slightly taller bay adjoining mill. 20th century full-height garage door to N elevation; timber-boarded door to right. Unfenestrated S elevation. Ridge stack. E RANGE: 2 storeys. Timber-boarded doors at ground and 1st floor to N elevation. 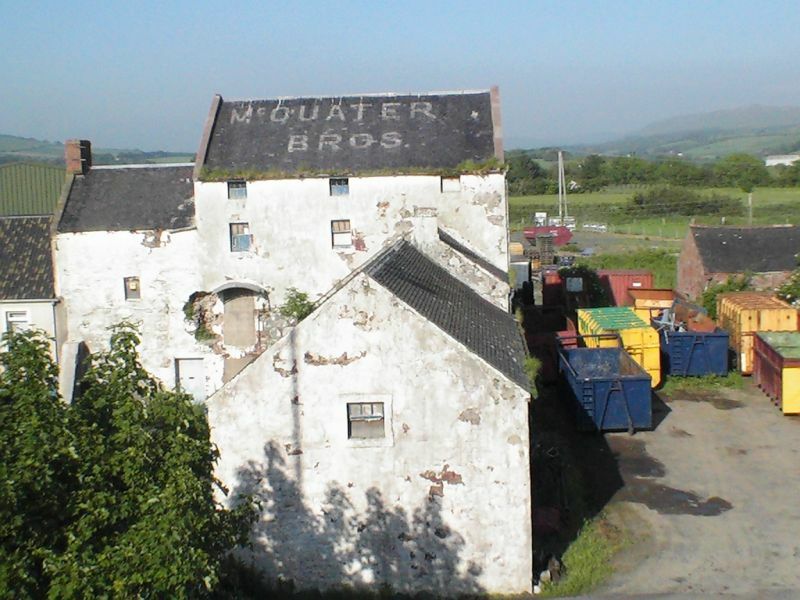 This was one of the most advanced corn mills in Ayrshire. It is marked on John Thompson's map of 1828, but was probably rebuilt in the mid 19th century: the layout shown on the 1st edition OS map has not changed very much. The mill was powered by water from the River Girvan driving a large breast paddle wheel. There were four pairs of mill stones, three driven in the usual way; the fourth pair were driven with overhead bevel pinions, a very unusual practice that involved suspending the top millstone from its drive shaft. The height of the building allowed large hoppers to be used. The kiln was used to dry the corn and oatmeal. The machinery was removed from the mill in the 1960s. Although this mill is of regional importance, it is listed at C(S) because of its delapidated condition.